Mon-Fri Walthamstow (WW) allocation withdrawn. 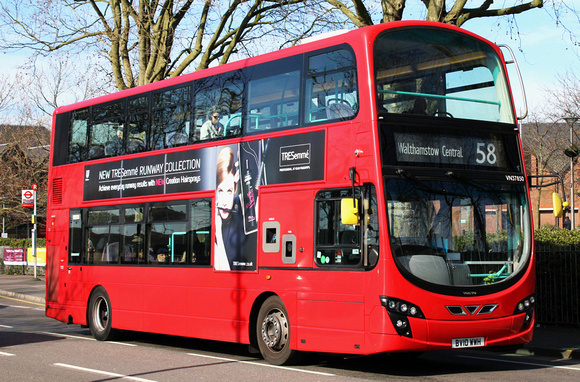 Extended from Crooked Billet to Chingford Mount to part compensate for Route 256 withdrawal. Withdrawn between Leyton and Chingford Mount except for Mon-Fri peaks - replaced by new 158. Saturday shopping hours and Sunday Route to Crooked Billet. Mon-Fri Peak Route to Silvertown extended to North Woolwich. Converted to double deck One Person Operation. Extended at all times from Leyton to Crooked Billet and further extended MS evenings to Chingford Mount. Mon-Fri early journeys extended from Crooked Billet to Chingford Mount. Withdrawn between Walthamstow Central and Crooked Billet / Chingford Mount and between Canning Town and North Woolwich. Diverted at Upton Park to East Ham instead of Canning Town which would partly compensate for the 162 withdrawal.